We have a wide selection of USDA Choice Certified Hereford Beef,Supreme Tender Pork, and Chicken from Smart Chicken and Tyson. Stop by and see what selections we have for you. Look for our "Mega Meat Sale" every Spring and Fall for extra special pricing and get meat cut and wrapped the way you want. Great for Grilling Season or filling the freezer. 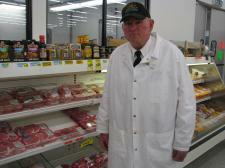 If you have questions, Harold Frickey, the Meat Manager can answer them for you.